Did you know you can now order your Deliveroo takeaway from Daylesford Organic here on View? Daylesford Organic is a unique venue which contains the Larder restaurant which serves a seasonal menu, the Raw Bar where you can dine on a selection of healthy raw cuisine and the Bread Bar Cafe where you enjoy a light meal and coffee in a relaxing atmosphere. 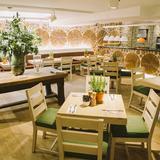 "Set in the heart of Notting Hill, Daylesford Farmshop & Café is all about organic, seasonal and delicious food. All our food comes straight from our organic farm in the Cotswolds to your fork: our meat and poultry, fruit and vegetables from our market garden, bread from our bakery, and cheese, milk and yoghurt from our creamery. Join us for a cold-press juice and morning browse of our organic farmshop, a super-healthy salad for lunch, an indulgent afternoon tea or supper with friends. Daylesford is one of the most sustainable farms in the UK. We want to grow, farm, produce and sell food in harmony with the environment. We have won over 60 national and international awards over the last 3 years for our delicious food, our sustainable practices and our farmshops and cafés." What did you think of Daylesford Organic? 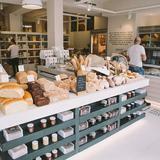 The latest addition to the brand’s stable of artisan, seasonal and funnily enough, organic delicatessens, this Notting Hill branch brings yet more quality fare to the wealthy well-to-do of West London, throwing in the same hefty prices whilst at it. 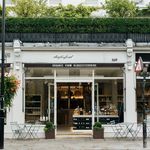 Sitting pretty on leafy Westbourne Grove, the understated exterior of Daylesford Organic entices the pastel-decked denizens of Notting Hill in their droves, especially at lunch, where ladies who do just that are joined by a veritable plethora of cooing food fans. A gleaming glass frontage offers a taste of what lies within but if you’re just browsing there are a couple of menus standing to attention and staffing the door, acting as imposing deterrents to those without the means. There are three areas where you can eat, including a cafe, a raw bar and the Larder Restaurant. The interior is filled with all the rustic elements you’d expect from somewhere that places such an emphasis on sourcing independent produce, so expect to see snaking foliage, wooden-fence panelling and wicker baskets offering tempting examples of what’s in store. A large mural showcasing typical larder produce helps to brighten up the strange devotion to beige that infects the walls, chairs, tables and anything else within easy reach of a paintbrush, whilst an unintentionally hilarious promotional video for the brand’s ethos offers an amusing interlude between courses. 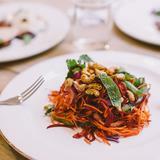 It’s hardly a varied bunch settling down to dine at Daylesford, with the typical Notting Hill set enjoying long lunches, quick bites and sometimes even extended stays into the evening. It’s very much a neighbourhood restaurant, so expect to see air kisses galore as passers-by spot their friends, pop in and pull up a pew. It is, however, a great place in which to dine alone too, especially if you get a window seat where you can watch the world of Westbourne Grove meander idly by. This idle meandering hasn’t yet affected the friendly staff though, who start off as attentive and considerate, then descend into well-meaning intrusiveness, before finally settling for forgetful neglect as they make you wait what feels like an age to pay your bill. They are, however, incredibly knowledgeable about the food, the preparation, the cooking processes, the brand and probably anything else you might want to know about organic fare, suggesting that the management’s self-congratulatory preoccupation with their ethos has created something of an imbalance when it comes to training. This is Daylesford Organic’s real draw, as the wealth of ingredients available to purchase individually are put together on an, albeit unimaginative, menu to pretty good effect. The almost pretentious warbling on about the quality of the produce is actually justified, with the flavours often being so vivid and vibrant that they taste like caricatures of those more readily available. One reason for this is the venue’s adherence to shaping their menu around seasonal produce, so anything you order will not only be organic, but also fresh and perfectly in season. The results are enjoyably found in starters such as the venison carpaccio (£10.95), which boasts immeasurably thin slices of bright red, tender venison carefully arranged on the plate and dressed with strips of sharp beetroot, sweet, flavoursome honey and a smattering of fresh leaves and parsley. The mains are also impressively constructed, with a carrot and spring onion risotto being one of the better value options (£10.95, or £6.95 for a starter sized portion), and still tasty. It’s impeccably cooked in a well-seasoned vegetable stock that gives it a gentle yellow tinge, and served with incredibly flavoursome chopped spring onion. Thinly sliced carrots that have been given a gentle fry to offer the tiniest hint of crisp are then sprinkled over, offering a deliciously complementary garnish to a dish that makes up for its lack of excitement and flair with warmth and flavour. In keeping with the fact that Daylesford Organic is an incredibly posh version of your average farm shop, expect to find excellent examples of the usual freshly-squeezed apple juices, orange juices, grape juices and many more, from £3.50 to £4, as well as the odd health shot like the infamous wheatgrass. Add to this a host of vitamin and nutrient rich options, good quality teas and coffees and well-priced water and you get the gist. If you do fancy a little tipple with your meal though, there’s adequate enough scope in which to do so, with some really good organic wines being available. The Chateau Leoube is great choice if you like a drop of red, offering fruity, quaffable flavours at an affordable £18. A Chateau Leoube rose is also available for £18 as well. This pleasant enough little venue is one that no doubt charges far too much simply for the reassurance that you’re enjoying the very best produce, leading the good life and helping to keep independent producers in business. The trouble is it tastes good enough to almost be worth it.